Don't forget this weekend is Princeton's annual S.H.R.R.E.D.temberfest on Saturday, September 26th from 10 am to 2 pm rain or shine at Witherspoon Hall parking lot, 400 Witherspoon St. This annual event organized by the Public Works Department and provided by the NJ Clean Communities Grant & the NJ DEP Recycling Tonnage Grant, is a great way for Princeton residents to recycle many household items rather than send them to a landfill. Check out the Princeton Municipal website for a complete list of what you can and cannot bring. Also taking place on this day is the Mercer County Improvement Authority's last Household Hazardous Waste Collection and Electronic Recycling Event in 2015. 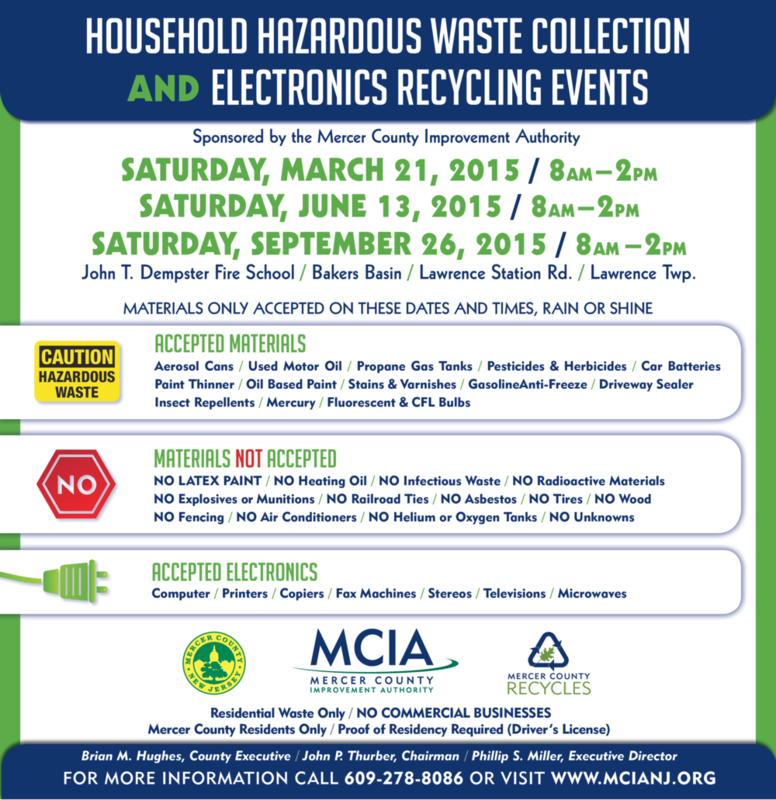 Mercer County residents can bring hazardous waste and electronics for recycling and safe disposal. The event takes place at the John T. Dempster Fire School 350 Lawrence Station Road, Lawrenceville. Go here for details on what materials are accepted. Not able to make it S.H.R.R.E.D.temberfest or to the MCIA event, check out the Princeton Municipal website for more information about recycling. Been waiting to get rid of old electronics that have served their useful purpose and are taking up space around the house but don't know what to do with them? Twice a year the Mercer County Improvement Authority (MCIA) holds an Electronic Waste and Document Shredding event. Mercer County residents may bring used electronics, including computers, televisions, and printers (proper identification required). The next event is this Saturday, February 7th from 9:00 am - 2:00 pm at the Sun National Bank Center in the City of Trenton. These products are collected and sent to a recycling facility for processing. More information about recycling can be found anytime with MCIA's my-waste app. Can't make it this Saturday? Princeton residents can recycle computers, televisions, and other electronics at the Convenience Center on River Road. An appointment may needed to drop off material. Contact Princeton's Recycling Coordinator, Janet Pellichero, at 688-2566 for information Monday – Friday from 9:00 am - 2:00 pm.